Chicago (7–4–2) started the weekend on Saturday with a last-second goal that sent the South Side supporters jumping for joy in a hard-fought match against UW–Whitewater (14–4–1) and engineered history by setting a school record in a 15–0 victory against Rockford (0–17). Coming off a 0–4 loss to Case Western (6–4–4), the Maroons had to bring their all against Whitewater, a 14-win team. The first half featured even play, with both teams firing off two corner kicks and a similar number of shots. The Warhawks got on the scoreboard in the 66th minute off a free kick 35 yards out. As time started ticking down, the Maroons looked for a way to get the ball in the box, outshooting Whitewater 10–3 in the second half, until a series of events that would prove fatal for the visitors. The Maroons celebrated. The visitors looked shocked. “It was the most rewarding feeling to finally put one in and with only a second left, we couldn’t control how happy we were and we all just dog-piled on Mike [Choquette]. It was a great experience,” said first-year forward Brenton-Neal Desai. Both teams entered overtime with their respective mindsets. “We brought a lot of energy into OT. We started OT going for the win, but we weren’t really able to capitalize on the momentum. They did a good job of settling down and not rushing out there. We had one or two half-chances, but other than that it wasn’t our best day as far as being sharp on the attack,” Babst said. With both teams unable to find chances to score, the hard-fought match ended in a 1–1 tie. 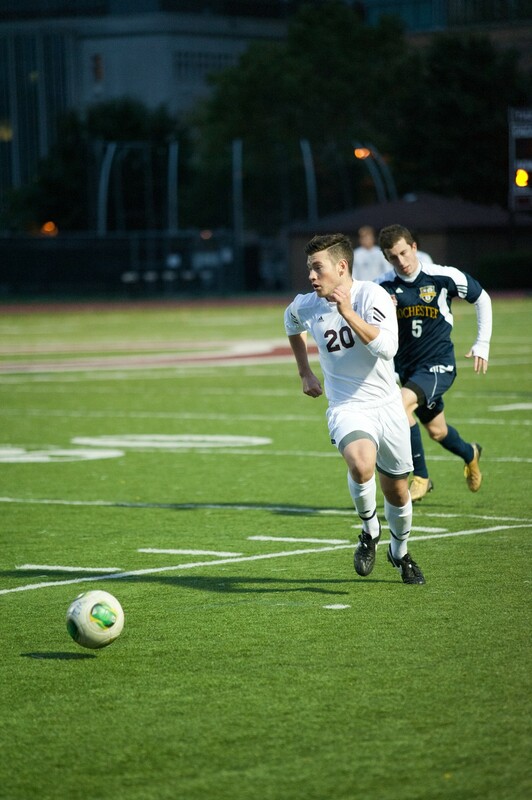 Against Rockford, the Maroons dominated throughout the entire game, recording 15 goals and breaking a school record that had stood since 1971 for most goals in a game. Eleven players scored for the South Siders, with first-year forward Victor Raber accumulating four. Chicago kicks off the weekend traveling to New York to play the NYU Bobcats (6–5–3) Friday at 11 a.m. Eastern Standard Time and will head to Massachusetts on Sunday to play Brandeis (11–4), with kickoff at 11 a.m. EST. With three games left in the season, the Maroons are putting all of their energy in to close out the season and play in the NCAA tournament. “Performance-wise we’re getting to the point in the season where it needs to be our best soccer, and every game we play is becoming more urgent to find that level for us where we feel like the game is going to be defined on our terms and us playing our best. We’ve gotten to be very healthy and have a full roster of guys,” Babst said.